If you are looking for a fun, healthy snack to make with your kids this is the one to do! These fishbowl bagels would be darling for an “Under The Sea Party”, “Mermaid Party”, “Back to Summer” party or just a fun way to create with your kids! I love that this snack is so versatile and yet so easy to put together whether you’re looking for a fun after school snack, or a fun dish to make your event extra special. 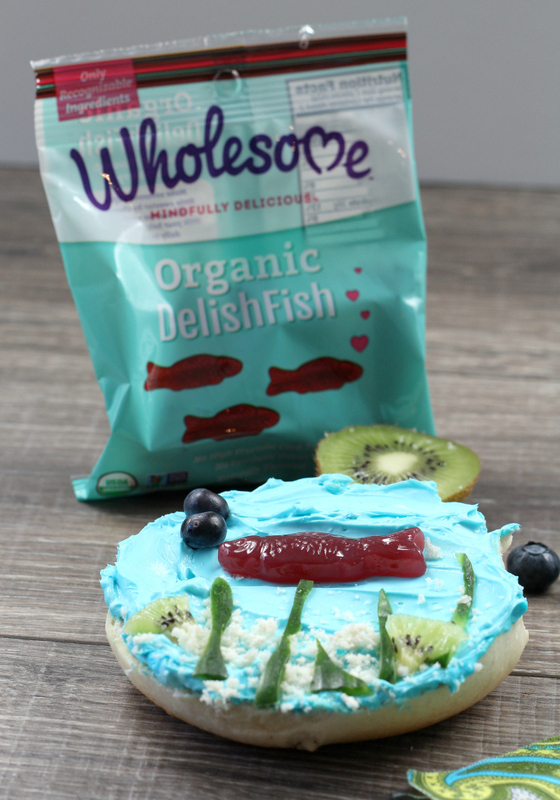 I partnered with Wholesome™ to share their delicious DelishFish™ organic gummy candies, they are easily the most delicious organic treat I’ve ever had and making these fishbowl bagels takes them to the next level of fun! For this recipe you will need: Bagels, cream cheese, English cucumbers, kiwis, DelishFish™ and blueberries! You are welcome to mix up the ingredients as you see fit of course. I chose English cucumbers as they are not bitter at all and they are packed with nutrients. Peel the English cucumber and slice into thin, wavy strips to imitate seaweed. This is a prep that you could do ahead of time if you don’t want your little ones cutting things. You could also prep the skins and have them use kid-safe scissors to cut the seaweed as well. You can prepare the kiwis as well by cutting the kiwi into slices, trimming the skin off, and then slicing into small triangles to resemble the ocean floor. You could pick any flavor cream cheese you want, I stuck with the original flavor and simply added some food coloring to make it blue. My kids loved helping with this part and stirring the color into the cream cheese. If you leave the coloring not fully blended it does look a little more like water! For the sand at the bottom of the fishbowl bagel I considered using crumbled up graham cracker, but realized using the extra crumbs from the bagel worked just as well and was one less ingredient to have to worry about. 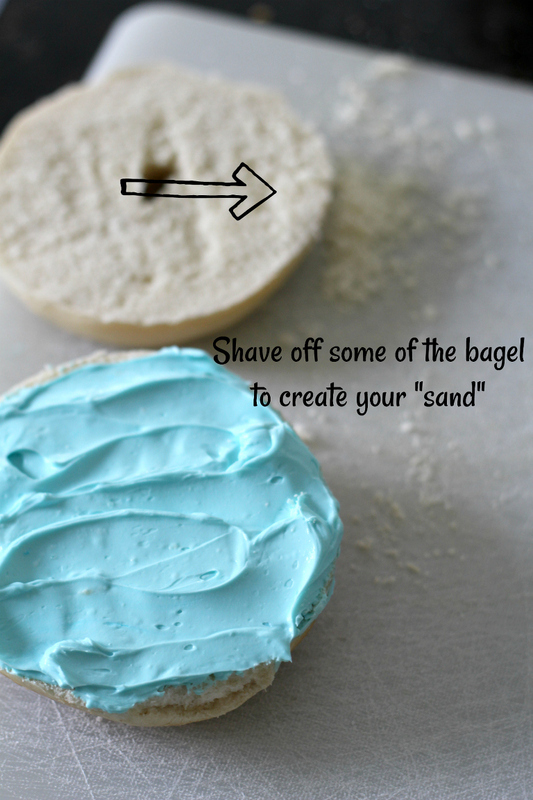 Because this bagel isn’t too sweet you could serve it for a snack, a brunch, breakfast, or side dish. Now you’re ready to put it all together! The kids’ favorite part of course was assembling the fish with the blueberry bubbles. DelishFish™ candies are made with ingredients you can recognize and that always makes me feel better as a mom sharing them with those I love. Organic Delishfish is an organic version of a popular fish-shaped candy made with organic, clean ingredients and free of artificial colors and flavors. Instead of high fructose corn syrup, the candy is sweetened with Wholesome Organic Cane Sugar and is Non-GMO Project Verified, Fair Trade Certified, USDA Organic, Gluten Free, Vegan and Kosher. DelishFish is available for purchase at Wholesome’s online store, and select Whole Foods, HEB, Sprouts, Ahold, Akin, Earthfare, MOMS and Wegmans stores nationwide. You could make these for your very own “Under the Sea” party or as a fun activity for a summer day! I hope you love them! This post was brought to you by Wholesome™ the leader in fair trade and organic sugars and honeys.